Peg Donovan has been telling stories in the preschool and elementary school setting for over 25 years. Her books, stories and puppets come to life with language and the joy of words. 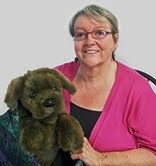 With a solid background in elementary education, children’s theatre and creative dramatics, Peg’s goal is to teach literacy by delighting preschoolers with stories, songs, poems, and puppets. Because the most basic of literacy skills are founded on oral competency, Peg tries to leave the class with “something to talk about”. She prepares a word-rich storytime of shared books, multiples (each child will have a copy of the chosen book to ‘read’ along), puppets, songs, felt board stories and audience participation multicultural folktales. Preschool teachers are often amazed that their class could sit still in rapt attention for 45 minutes. Even more significant are the gains these children make as a result of a 10-month residency, once a month, with the teachers using the books and stories, etc., repeating, discussing, and integrating them into the daily routine. As well as her favorite classroom work with preschoolers, Peg has appeared in many local elementary schools, several middle schools and high schools. Libraries state wide invite Peg to tell for the summer reading program. Peg has conducted regional workshops for children’s librarians and teachers. She's been a favorite workshop presenter at CAEYC (CT Assoc. for the Education of Young Children), Bright Horizons training day, Headstart staff development day, etc., where she demonstrates her methods for storytelling and getting children ready to read. Peg has performed in several storytelling festivals including the CT Storytelling Festival, the Johnnycake Storytelling Festival, the Toronto Storytelling Festival and the RI Storytellers in Concert.